When Leo X was elected pope in 1513, he had the opportunity to make his own contribution to the ambitious programme of decoration of the Sistine Chapel in the Vatican Palace. The site is highly important for Christianity as it is the official papal chapel where the pope is elected and official decisions are taken. The chapel was already highly decorative, following an earlier commission by Pope Sixtus IV (reigned 1471 – 84) for a series of frescoes on the side walls depicting the life of Moses and Christ. These had been painted by the leading artists of the early Renaissance: Pietro Perugino (Raphael's master), Domenico Ghirlandaio (Michelangelo's master), Luca Signorelli and Sandro Botticelli. In addition to this, Pope Julius II (reigned 1503 – 13), had recently commissioned Michelangelo's revolutionary ceiling frescoes (1508 – 12). This meant the only significant undecorated areas on which Leo X could make his mark were the lower walls, which he decided to cover with a tapestry cycle (a series of tapestries) . 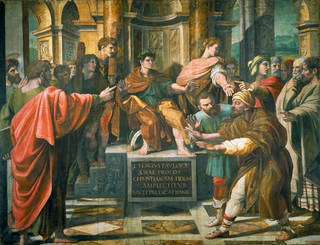 When Raphael was commissioned to produce the tapestry cartoons (a full-size preparatory design for the tapestries), he was already engaged in the decoration of two large rooms at the Vatican Palace – the Stanza della Segnatura and Stanza d'Eliodoro­ – and was, at this point, at the peak of his career and the most celebrated artist in Rome. 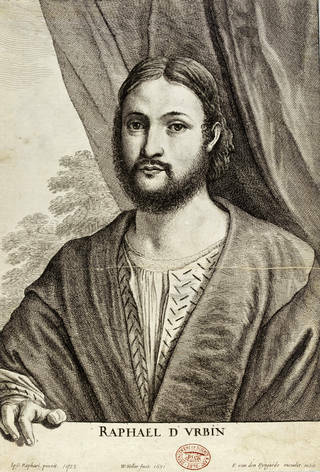 In designing the cartoons, Raphael faced a twofold challenge. 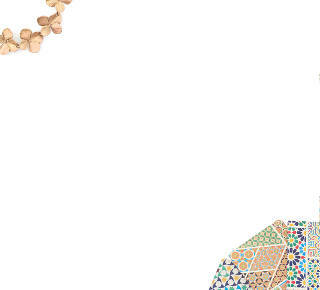 Firstly, he had to comply with the existing decoration of the Sistine Chapel and adapt his design to the style of the previous generation. And secondly, he had to create a design that would survive the translation from a work on paper to the less subtle medium of tapestry. The ability to work across different media was a speciality of the Renaissance workshop. The most successful workshops, or botteghe in Italian, relied on a vast range of artistic competencies and skills to produce a variety of luxury goods, from easel paintings to frescoes, sculptures and architectural schemes, as well as designs for textiles, embroidery and inlaid wood or stone marquetry. 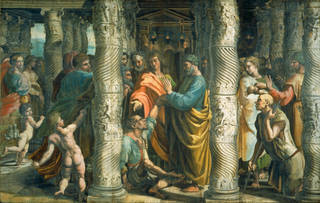 This was the case with Raphael's large workshop in the Vatican, which included leading artists such as Giulio Romano (1499 – 1546), as well as lesser known collaborators, including Giovan Francesco Penni (1490 – 1528), Perino del Vaga (1501 – 47), Giovanni da Udine (1470/75 – 1535) and Tommaso Vincidor (1493 – 1536). 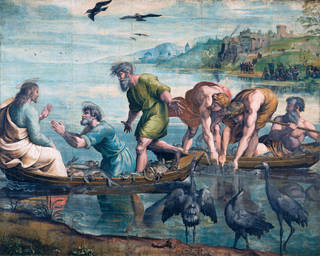 The cartoons were created from a collaborative effort, as were most large scale works produced during the Renaissance. Despite debates over how much of the cartoons Raphael himself painted, we know he was directly responsible for the overall composition, and the expressions and gestures of the different figures, which he knew would have to be reversed when they were translated into tapestries. Once completed, the cartoons were sent to the workshop of the tapestry-maker Pieter van Aelst in Brussels. Here they were cut into vertical 90 centimetre-wide strips to allow the weavers to place the cartoons directly under low-warp looms. As a result, some details differ between the cartoons and the tapestries, most notably the colours. Conservation work in the 1990s revealed that the cartoons had also been pricked – a technique sometimes used to enable copying – before they were cut into strips by the weavers. 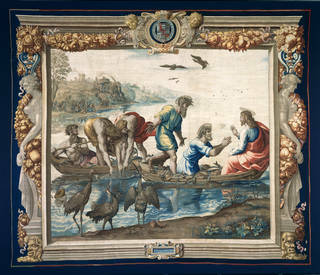 The low-warp loom method produces a reversed image of the original design, meaning master designers, such as Raphael, would have to anticipate this in their compositions. Although Italy had at that time several centres of textile production, the Low Countries (the Netherlands and Belgium) had made a speciality of tapestry weaving since the early 14th century. Ten tapestries were delivered to the Vatican Palace between 26 December 1519 and December 1521, but only seven cartoons have survived. 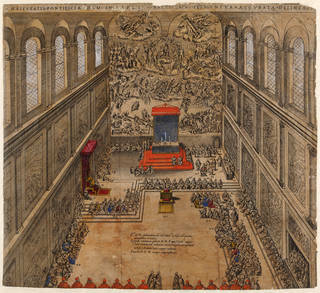 The print above shows a view of the Sistine Chapel in 1578, which depicts four of the tapestries hanging at the bottom of both side walls at that time, in the following order: on the extreme left is The Miraculous Draught of Fishes; next to it, nearer the altar, is Paul Preaching at Athens; on the extreme right is The Death of Ananias; next to it, nearer the altar, is The Blinding of Elymas. The tapestries depict scenes from the lives of Saint Peter the Apostle and Saint Paul, known as the Fathers of the Christian Church. Saint Peter, a Jewish fisherman, was a disciple of Jesus Christ. 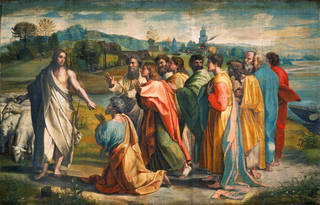 He was recognised as the leader of the 12 disciples and the first of the succession of popes. Catholic tradition holds that St. Peter's Basilica in the Vatican City is the burial site of Saint Peter. All four cartoons depicting the life of Saint Peter have survived: The Miraculous Draught of Fishes (Luke, 5:3–10) and Christ's Charge to Peter (John 21:15–17) show episodes from the calling of Peter as a disciple of Jesus. 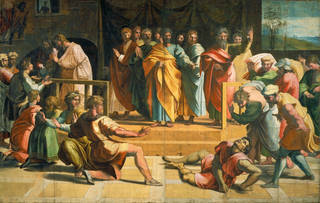 The Death of Ananias (Acts 5:1–6) and The Healing of the Lame Man (Acts 3:1–11) depict Peter accomplishing miracles. 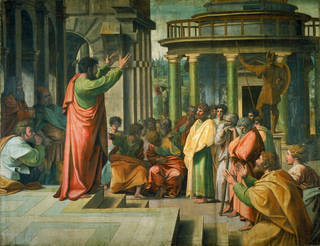 Of the six cartoons dedicated to the life of Saint Paul, only three have survived: The Conversion of the Proconsul (Acts 13: 1–7), The Sacrifice at Lystra (Acts 14: 8–18) and Paul Preaching at Athens (Acts 17:15–34). We can appreciate what the three lost cartoons may have looked like thanks to their surviving tapestries, which illustrate the conversion and preaching of Saint Paul: The Conversion of Saul (Acts 9:1–7), The Stoning of Stephen (Acts 9: 1–7) and Paul in Prison (Acts 16: 23–6). In addition to Pope Leo's tapestry cycle, further sets were produced from Raphael's designs over the 16th century. A set of tapestries were woven before 1534 for François I, King of France. This set remained in the French Royal Collection until 1797 when it was burnt during the French Revolution (1789 – 99) in order to extract the silver and gold threads. Another set was made for King Henry VIII in about 1540 and was delivered to Westminster Palace in 1542. In addition, two further sets were produced in the late 1540s and early 1550s for the Emperor Charles V (held in the collection of Patrimonio Nacional, Madrid, Spain), and for the Cardinal Ercole Gonzaga (held in the collection of Palazzo Ducale, Montua, Italy). These sets retain the same iconography but their frieze borders (not included in the cartoons) differ from one set to another. 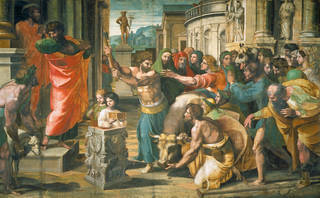 Following the delivery of the tapestries to the Vatican Palace, we lose trace of the cartoons for nearly a century until their sudden reappearance in England in 1623 after the Prince of Wales, the future King Charles I, acquired them from an unknown source in the Italian city of Genoa. The fate of the cartoons in that intervening period remains unclear. The most common theory is that the cartoons – with the exception of The Conversion of the Proconsul, which appears in the collection of Cardinal Grimani in Venice by 1521 – remained in the workshop of Pieter van Aelst or his fellow tapestry makers in the Netherlands. Indeed, cartoons often remained the property of the weaver and some early accounts suggest that the cartoons were still in Brussels in 1573. When the cartoons entered the collection of Charles I, they were probably still in the form of long vertical strips, as each of them bears the stamp of Charles I's monogram on the reverse (verso). The set of tapestries woven for Henry VIII were still held in the Royal Collection in the 17th century and may have inspired Charles I to commission a set of his own from the original Raphael cartoons. Full-scale tapestries from the cartoons were made for Charles I at the Mortlake tapestry manufactory between 1626 and 1642, under the supervision of Sir Francis Cleyn, head of the Mortlake manufactory. One example of the Mortlake tapestries (on loan from the Trustees of the 9th Duke of Buccleuch's Chattels Fund) is on display in our Raphael Court, facing the Miraculous Draught of Fishes cartoon. Around the same time, another set was acquired by the third Earl of Devonshire (1617 – 84) for Chatsworth House, where they still hang today. After the execution of Charles I in 1649, his collection was dispersed as part of the Commonwealth Sale 1649 – 54, with the exception of a few works retained by Oliver Cromwell, who was at the head of the new republican regime. Among these were Raphael's cartoons and Mantegna's great cycle of the Triumphs of Caesar, which remained the property of the Nation. However, the set of tapestries made for King Henry VIII was sold along with nearly 2,000 works of art to settle the late king's debts and raise money for a new military campaign. Henry VIII's tapestries were acquired by the Kaiser Friedrich Museum in Berlin in the 19th century, and are presumed to have been destroyed in the Second World War. Charles I's set made by the Mortlake manufactory were sent as a diplomatic gift to the King of France by Oliver Cromwell and are still in the French collection today (Mobilier National). Following the Restoration of the English monarchy in 1660, the cartoons returned to the possession of King Charles II but their history of public display only really began after William III became king in 1689. The cartoons were put on public display at Hampton Court in 1697 so that copies could be made. It may have been around this time that the strips were definitively reintegrated in the first recorded restoration, which was carried out by Parry Walton (died 1699), the Surveyor of the Queen's Pictures, and the painter Henry Cooke (1642 – 1700). 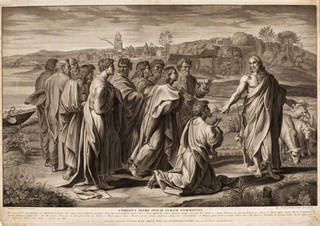 As a result, a series of engravings was made by the French engraver Nicholas Dorigny between 1711 and 1719. 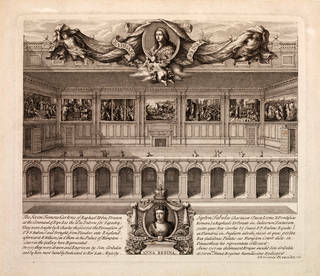 The new setting devised for the permanent display of the cartoons at Hampton Court can be seen in the frontispiece to another set of engravings produced by Simon Gribelin (1661 – 1733). As part of the display, the cartoons were raised above head height, had green silk curtains attached to them to protect their colours from fading from the light, and a fire was kept alight throughout the winter to reduce the humidity of the room. The cartoons then moved between Buckingham House (1763), Windsor (1787 – 88) and back to Hampton Court (1804). Between 1817 and 1819, the cartoons were exhibited at the British Institution, whilst The Charge to Peter cartoon went to Somerset House, on loan to the Royal Academy for copying, in 1823. The survival of the cartoons is remarkable. 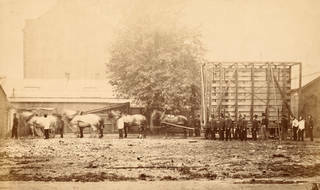 Richard Redgrave (1804 – 88), who was appointed surveyor of the Queen's Pictures in 1857, informs us that they were often handled without appropriate care. He reported that "tracing was allowed [with] large sheets of paper pinned onto the cartoons, and a hard pencil used to trace the lines". As a result, much criticism appeared in the press. 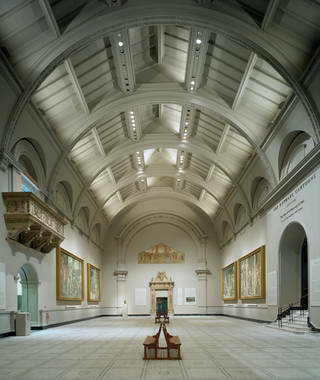 When the National Gallery was founded in 1824, it was felt that this would be their natural home, but this option was forgotten after several alternative proposals were made. 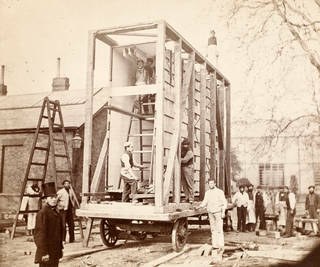 The Great Exhibition of 1851 led to the foundation of the South Kensington Museum (later the V&A), which Richard Redgrave supervised together with Henry Cole (1808 – 82), the Museum's first director. The cartoons were finally deposited on loan at the South Kensington Museum in 1865 as a tribute to Prince Albert, who had died in 1861 and had shown particular interest in their conservation and preservation. In 1950 the cartoons were moved to a new spacious gallery, similar in size to the Sistine Chapel, and underwent some discreet restoration in 1964 – 65. The whole gallery was redesigned in 1992 – 3, inaugurating the current display of the cartoons.